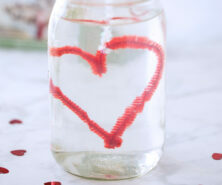 These conversation hearts are really simple to make! 1. First you need to bake your sugar cookies. Or you can also buy the store bought sugar cookie dough and work from there. 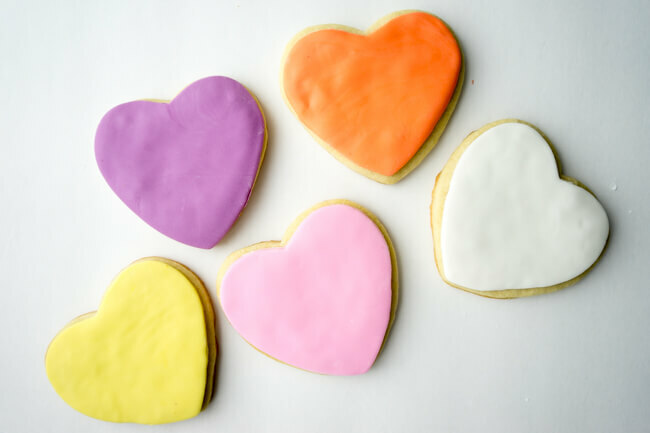 Once you have your dough, use a large heart cookie cutter to cut out your heart cookies for baking. 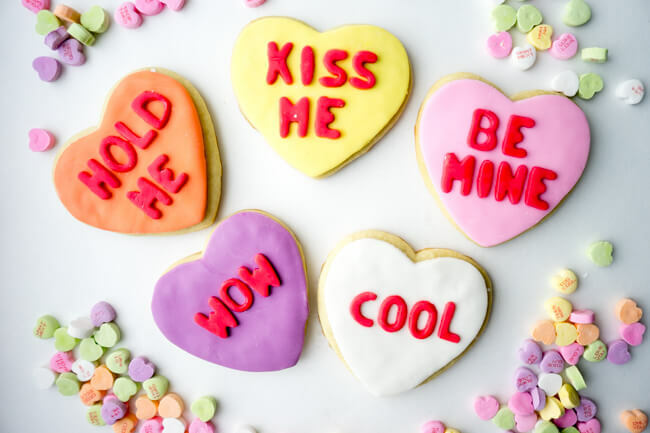 PRO TIP: You MUST refrigerate the cookie dough as per the instructions or your heart cookies will lose their shape (and look like a hot heart mess!). 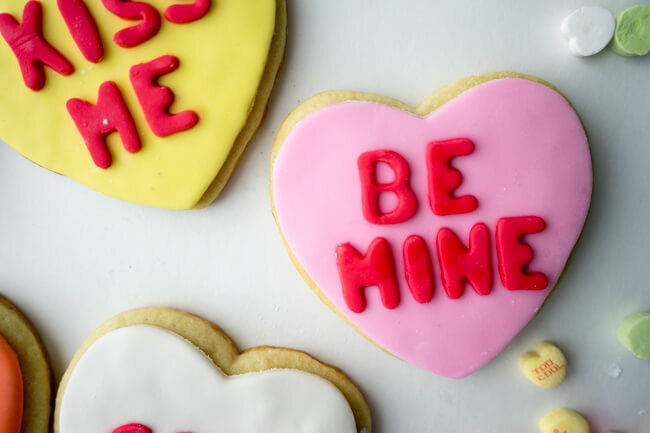 In addition, once you have cut out your cookies in heart, pop them back into the refrigerator for 15 minutes before baking. 2. 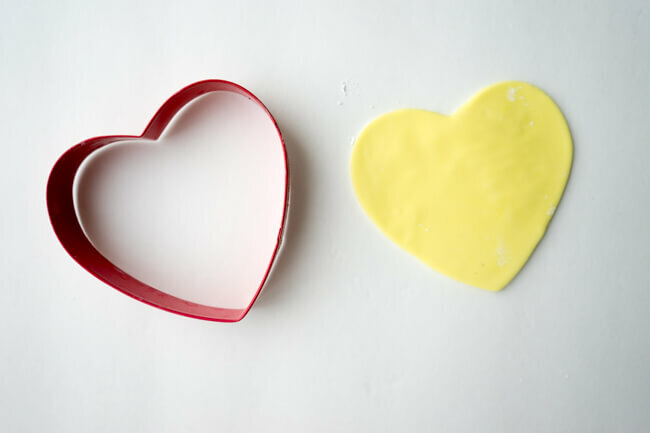 Now it’s time to tint your fondant for applying to the top of your cookies! As mentioned, I buy the plain white fondant and tint it using different icing colors. That gives you the most flexibility. Just apply a little but of icing color into a ball of fondant and knead until you get it to the color you’re looking for. Also, I matched the colors using real conversation heart candies! 3. Once you have your colored fondant. Roll this out with a roller and get it to a thickness you are happy with. It’s pretty sweet, so I like to make thinner shapes however this does make it harder to transfer. 4. Now place on your cookies. In order to place them on your cookies. Brush a little bit of water on the cookie and then use a spatula to scoop up the heart and place on the cookie. Gently press down. You can also use a fondant smoother but I just used my hand. This is how all of my cookies looked after applying the fondant! 5. 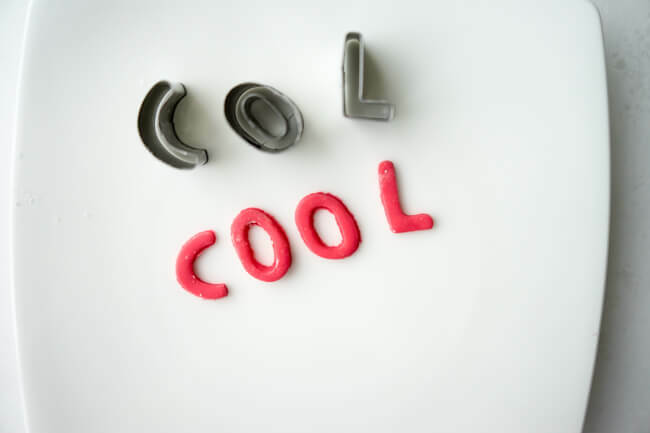 Next, cut out your words and phrases using your letter cookie cutters. This is a bit tricky as the fondant can be a bit difficult to work with. Also, be careful and gentle with it and you should be able to transfer it to your cookie. Brush on a bit of water again on the back of each letter and gently press onto your cookie. Finally, here are the finished conversation heart cookies! I think they turned out pretty sweet! 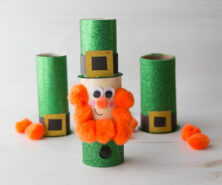 And they are so much fun to make! 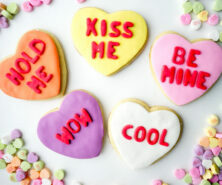 These would be especially fun for kids to make because they can decide what words and phrases to put on the cookies. Print the Recipe & Directions Here! First you need to bake your sugar cookies. I personally like to use the Joy of Baking sugar cookie recipe. But you can also buy the store bought sugar cookie dough and work from there. 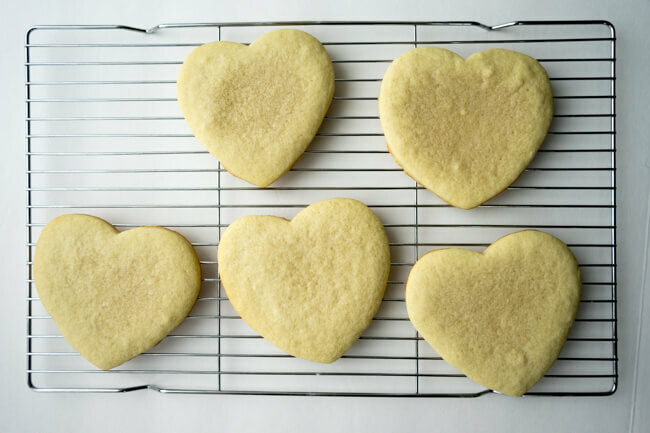 Once you have your dough, use a large heart cookie cutter to cut out your heart cookies for baking. Now it's time to tint your fondant for applying to the top of your cookies! 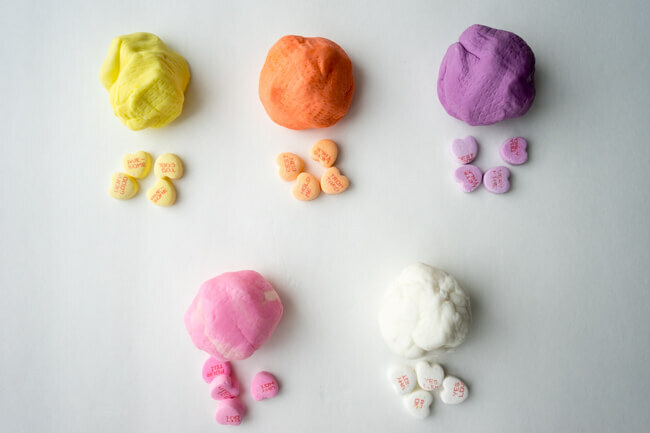 Just apply a little but of icing color into a ball of fondant and knead until you get it to the color you're looking for. Also, I matched the colors using real conversation heart candies! Once you have your colored fondant. Roll this out with a roller and get it to a thickness you are happy with. It's pretty sweet, so I like to make thinner shapes however this does make it harder to transfer. Now place on your cookies. In order to place them on your cookies. Brush a little bit of water on the cookie and then use a spatula to scoop up the heart and place on the cookie. Gently press down. You can also use a fondant smoother but I just used my hand. This is how all of my cookies looked after applying the fondant! 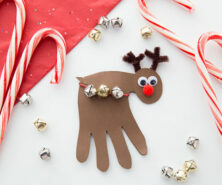 Next, cut out your words and phrases using your letter cookie cutters. This is a bit tricky as the fondant can be a bit difficult to work with. Also, be careful and gentle with it and you should be able to transfer it to your cookie. Brush on a bit of water again on the back of each letter and gently press onto your cookie. 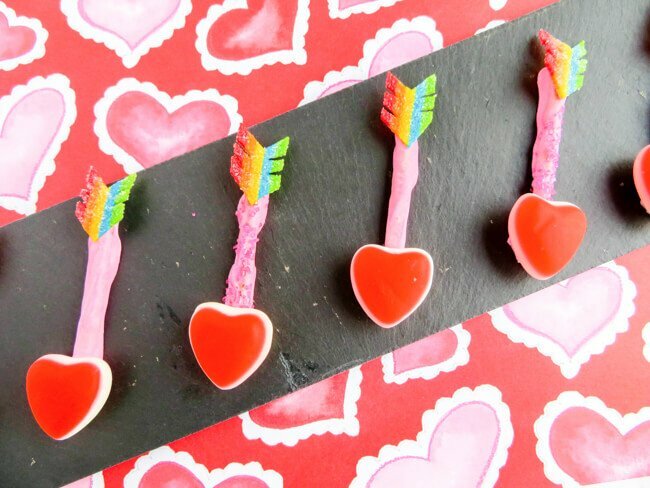 If you want to have more Valentine’s Day fun, make these easy and fun DIY Cupid Arrow Candy Treats!